Achieving your short term, and more importantly, your long-term financial goals is similar to helping a patient maintain healthy teeth throughout their lifetime. You need to determine any issues that are adversely affecting your financial health and establish a program to resolve them. 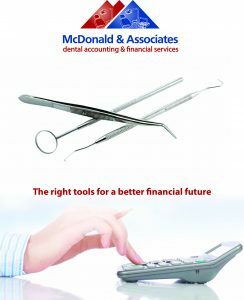 At McDonald & Associates, we know that working with a dentist means more than simply providing accounting and tax services. It means having an in-depth understanding of the complexities involved with the financial management of your practice. As the dental financial experts, we relieve the concerns of payroll, tax planning, succession planning, and accounting. As a result you can focus more time working with patients. Your hard work should be reflected in your profit. Because of our periodic reviews of your financial statements will keep track of your finances, which can result in significant savings and increased cash flow. As the owner, you do not want to over pay taxes. Our tax planning experts will review your individual and corporate taxes to be certain you are keeping as much of your hard-earned profit as possible. The tax laws are constantly changing and causing mistakes if you are not an expert. Whether you have a few or several employees, we can prepare your payroll and payroll taxes to follow all current laws. From payroll to other financial statements, we keep all information confidential and we send all direct deposit pay stubs through a secured email. Employee theft can be hard to detect. Because of this difficulty, we will implement segregated duties to make it easy to spot any issues. If needed, we can provide an external controller to assure you fully understand all financial information to make informed decisions. Even if you have never been audited, the potential exists. We can assist in audit proofing your return and are able to offer representation during an audit including tax court. If you aren’t sure about the best strategy for your retirement, we can develop an exit strategy or succession plan that fits your practice and goals. Obtaining equipment for your practice can be a challenge. We are able to evaluate reasonable financing options to assure you continue to provide the best care for your patients. Many of our dental clients were using manual accounting systems, which are costly and contain ineffective procedures. As QuickBooks TM Pro Advisors, we can set up QuickBooks TM. Because of this service, we assure the accuracy of your financial records resulting in higher profit margins. Please contact me about your dental accounting and financial services. From small practices to large, we will develop a program to provide the efficient and responsive service you need. Give us the opportunity to explain how we can maximize your wealth – and make the transition to our services painless.